The International Marie de France Society (IMFS) was founded during the seventh triennial Congress of the International Courtly Literature Society, which was held at the University of Massachusetts in Amherst from July 26 to August 1, 1992. Its mission is to establish friendly and productive exchanges between faculty, independent scholars, and students interested in Marie de France and the anonymous lays. 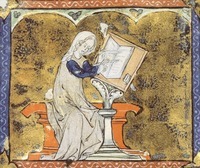 The International Marie de France Society regularly sponsors three sessions at the International Congress on Medieval Studies (Kalamazoo, Michigan). Topics and titles of sessions are decided at the annual business meeting in Kalamazoo. A call for papers is issued by mid-August and abstracts should reach the organizer by September 15. Le Cygne (the peer-reviewed journal published by the society) accepts submissions on Marie de France and the anonymous Breton lais and their Middle English (and other) adaptations. Submissions are welcome from those who are not members of the society; but contributors will be asked to join upon acceptance of their submission for publication.